“Patterns of Resistance,” the title piece of UMOCA’s latest foray into “forward-thinking art” is a very large, intricate painting in blue and gray. 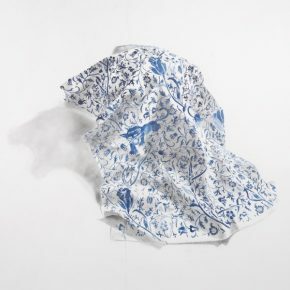 In the midst of imposing space, created by joining two of what were probably the largest sheets of paper the artist could find, it depicts a white bandana decorated with a dense pattern of floral motifs and draped so that, with its meticulous perspective and shading, it appears photographic when seen from a distance or in a photo. A couple of its parts don’t quite fit, though. Padding stealthily through the ornamental jungle, its mouth open in a snarl, comes a menacing black jaguar, while one of the flowers is seen, on closer inspection, to contain a clenched fist within a pair of bracts. These images ought to subvert the otherwise feminine character of the textile, and yet in person they don’t. Maybe it’s the sheer size, big enough to fill a gallery wall and assert its importance, or the universalizing blue-on-white color scheme, well known from Delftware depictions of a broad spectrum of life. Then again, maybe it’s the popular suspicion that the female is more deadly than the male, the lioness more to be feared than her mate. Or could Firelei Báez, this year’s winner of the Doctorow Prize for Contemporary Painting, wish to express something less conventional than those tired, confrontational clichés? From Plato to the present, for most of the history of Aesthetics, the term “political art” has been an oxymoron. As recently as a century ago, the writings of James Joyce were full of reflection upon the theories of Thomas Aquinas, to the effect that any work of art that advocates an ideological position, or that moves a viewer to take political action, must be defective. Indeed, when political art is mentioned, most educated listeners immediately think of Socialist Realism, the poster art of the Soviet Union and China, with its bellicose postures, theatrical gestures, and comic facial expressions. Of course those were the propaganda of a briefly victorious, dominant ideology, made for an audience whose ignorance of the message could be punished severely. Perhaps a truly liberating political art can only surface among a genuinely oppressed people, such as the members of an ethnic or cultural minority, or among the one majority that has never transcended minority status: women. Starting from that point of view, the characteristics of Firelei Báez’s art take on rational, if urgent dimensions. In answer to the first question, Why so large, the obvious answer is that Báez is responding to the common fate of women and their work: to be marginalized and undervalued. After all, it was men who put America on the world’s art map with Abstract Expressionism, in which enormous size was essential. For Báez, with a broader American perspective that includes areas most affected by the African diaspora—Louisiana, Cuba, and the Caribbean in particular—an accessory, such as a bandana, a floral centerpiece, a doily, or a hairdo can make a statement when made large enough to assert itself and too large to ignore. Where craft, skill, imagination, determination, and self-esteem invested in small articles of personal adornment can usually be overwhelmed due to their characteristic modesty, making them large makes it harder to overlook the quality instilled in the details. At the same time, there is no sign of the antagonism one has learned to expect from more political Feminism. Instead of slogans, these really are works that assert the artist’s identity, which a viewer penetrates more deeply as she approaches the actual painting. One of the principles of mainstream art, at least since the time of the Impressionists, exploits the way a painterly illusion breaks down as the viewer moves closer, to be replaced by recognition of the artist’s materials and mark-making strategies. In part, this is a way for the artist to show off, justified by a metaphysical reminder of the artifice intrinsic in art. Báez intensifies these qualities by blocking her images with colored layout lines that can only be seen with the eye and from very close, especially in passages she chooses not to complete, where the indicated boundaries are like ghostly outlines of her intentions. In some works there are details not visible from a distance sufficient to permit taking in the whole. In an apparently tatted lace pattern, first chains, clenched fists, and hair picks, then jaguars, and finally “tiny” profiles of human and animal figures appear in sequence as smaller and smaller details become visible. In a gray- and cream-colored floral spray (with a single red berry), structural details of piercings, weaving, knitting, and illusory abstractions similarly emerge up close. In a widely circulated photo of Báez at work, she is seen painting with squeeze bottles and brushes, not on an easel or even a table, but in an enormous tray table perhaps 10-inches deep, which allows her to produce and control such wet effects as the way her images break down or fade out at their margins. In other places, the degree of intricate precision seems to defy work on such a large scale. One of the common critiques of Contemporary art is that it foregrounds subject matter while denying the viewer the satisfactory evidence of skill, but nothing of the sort happens here. One of the motifs mentioned so far—the azabache, a black coral fist ornament that originated in Cuba under the influence of African, Spanish, and indigenous influences—appears in all but one of the 11 works in Pattern of Resistance. 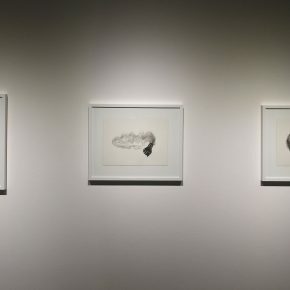 While its importance to Báez is unmistakable, and it (and the jaguar) also can be seen in many of her earlier works, its presence as a unifying element in this series of recent works is mainly characteristic of this body of work. As concerned as this artist is with resisting the suppression, co-opting, or absorption into a homogenized mainstream of her Dominican, African, black, and female cultural and personal attributes, the appeal to their power is only one of her strategies. Self-acceptance plays an equal part, as evident in a series of eloquent and humorous portrait busts, not included at UMOCA, titled Natural Grooming. In them, women rendered in black-and-white respond with sensual pleasure to being groomed by birds seen in their naturally colored plumage, engaging in various nest-building activities on and around the women’s hair. In fact, two of the more complex, large paintings at UMOCA also stress issues of self-acceptance. In each, Báez employs one of her favorite, and most effective devices. 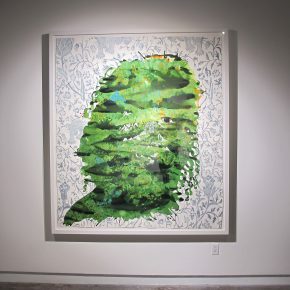 She uses a silhouette to locate a mixture of attributes within a subject whose presence is implied rather than shown, a gestalt discovery for the viewer’s perception. Here what is seen is a woman, the shape of whose head and hairdo organize abstract or representational matter, while her eyes alone serve as portals through which a viewer may enter into her consciousness and perceive her mood, her history, or what’s “on her mind.” In previous series, like “Prescribed Seduction,” silhouettes have bounded patterns derived from flower gardens, woven textiles, and geometric abstractions. In this first portrait, color, almost alone, conveys the figure’s mood. Rays like a neon and pastel rainbow fan out from above her ear, where a flower might be worn. A subtle contrast emerges between her hair, done in watery swirls of pink and yellow, and her skin, which displays a green redolent of nature that binds her to earth, a feeling reinforced by her eyes. What starts out celebratory ends up as contemplative. The other head contains (and consists of) a jungle landscape, featuring forested mountains, crags, and pinnacles surrounding a village built on a precipice. Here a pale version of the bandana forms a second, outer boundary. And again, the eyes that look out from this nature scene seem wary, observant, and aware. 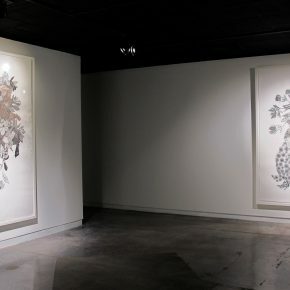 Among the smaller paintings, two feature a silhouetted hand, each filled in with a richly suggestive abstract pattern, each holding a lock of hair. For a Dominican woman, from a land where smooth or curly hair was once a legal distinction between ”black” and ”too black,“ hair carries significance beyond personal adornment. As essential as her origins in the Dominican Republic are to Firelei Báez, also important are her subsequent peregrinations: to the bohemian East Village in New York; to Skowhegan, Maine, once the site of a notorious massacre of indigenous Americans; to Hunter College, on prosperous Long Island; and to various art facilities on the Lower East Side and the Bronx before she settled in Brooklyn. She explains that only through contact with other cultures and points of view can the members of a cohesive community like hers gain the ability to see themselves and their characteristics clearly. 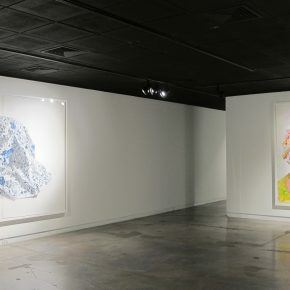 For all the attention she has garnered, from New York to Los Angeles, and along with such prestigious recognition as the Joan Mitchell Painters and Sculptors Award and the Jacques and Natasha Gelman Award in Painting, right now what matters is her receipt of the 2015 Catherine Doctorow Prize for Contemporary Painting. Utah is fortunate to have the Doctorow Foundation and UMOCA bring such a promising artist to the state so early in an already influential career. While Patterns of Resistance does not represent anything like a summation of her interests or directions, it does give her the chance to make a cohesive statement of her aesthetic concerns as they emerge from her social vision, and to do so at a historical moment when she is grounding the too-frequent spectacle of today’s art in the essential work of transcending those traditional boundaries that have limited the visibility of, and the respect due to, an entire population. Patterns of Resistance, featuring the work of Firelei Baez, is at the Utah Museum of Contemporary Art in Salt Lake City through January 16, 2016. This review appeared in the November 2015 edition of 15 Bytes.